We know this question comes up a lot from less experienced swim instructors, so we’re sharing our response here. Introduce back float as early as possible. We introduce it with babies, so resistance is minimized early on. Standing upright, hold the child against your chest and stomach with the child facing out. It’s important to hold the child close to your body as it gives them a sense of security. In this standing position, and continuing to keep the child close, position the child’s head on your shoulder, with your cheek pressed gently against their cheek or forehead area. If the child tries to lift their head, that’s okay. You can eventually move one hand up to their forehead to guide them back into place. 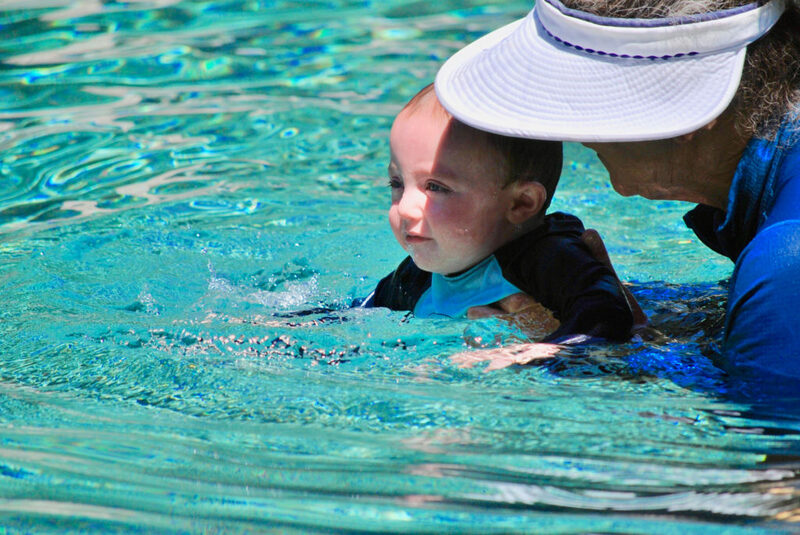 As you move through the water (easy, continuous movement is important here as it’s a distraction for the toddler, among other things), gently ease your body back towards a back float position. Do not go fully horizontal on the first or even second day. It may take time to get there. This all needs to be done by an experienced teacher who can bring a child into this position within seconds. As most early learners don’t like this exercise, we tell them we’ll do it for only 3 seconds. Then we count aloud, “1-2-3.” This gives the child comfort in knowing exactly how long they’re going to be uncomfortable. At the beginning, you’ll count to 3 quickly. Over time, you’ll slow the pace of your counting. As the toddler becomes more engaged, you can invite them to count with you. It gives them a feeling of control of the situation and helps build their confidence. All the while (this goes for anytime you’re asking a child to do something scary) you are verbally encouraging and comforting them with words like, “I’ve got you. You’re okay. We’re almost done. You are safe. I won’t let go.” Your mouth is close to their ear, so even if the child is crying, they can hear you. Repeat. Always do a new exercise twice. It doesn’t necessarily have to be done back-to-back. The second time can be done a little later in your lesson. Repeating a new exercise helps lower the fear around it and starts to build confidence in the student. Finally, reward! Tell the toddler they did a very good job. Thank them for trying, and let them know you’ll practice that again next time because everyone must learn to float on their back. It’s part of learning to swim. Our mission is to cultivate highly effective swim instructors and enhance the quality of swim teaching programs in the U.S.